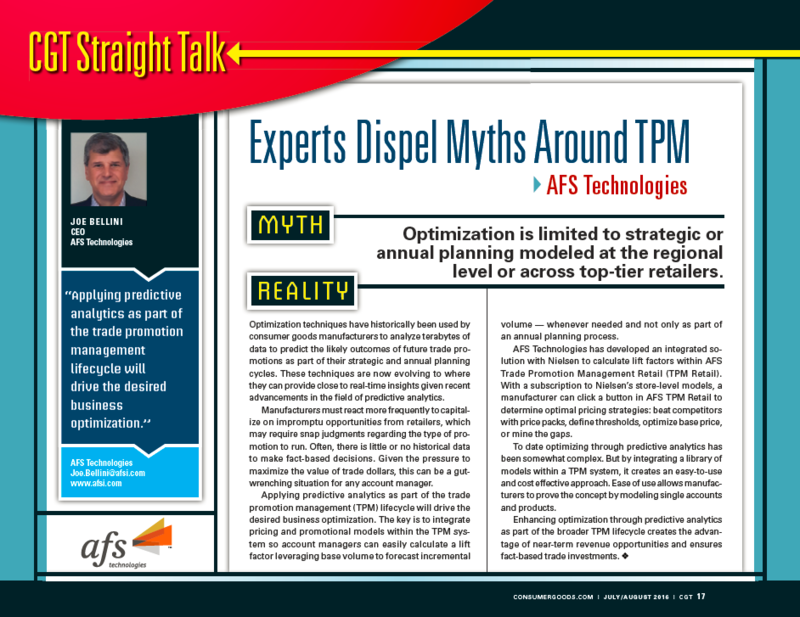 Optimization is limited to strategic or annual planning modeled at the regional level or across top-tier retailers. Reality: Optimization techniques have historically been used by consumer goods manufacturers to analyze terabytes of data to predict the likely outcomes of future trade promotions as part of their strategic and annual planning cycles. These techniques are now evolving to where they can provide close to real-time insights given recent advancements in the field of predictive analytics. Manufacturers must react more frequently to capitalize on impromptu opportunities from retailers, which may require snap judgments regarding the type of promotion to run. Often, there is little or no historical data to make fact-based decisions. Given the pressure to maximize the value of trade dollars, this can be a gutwrenching situation for any account manager. Applying predictive analytics as part of the trade promotion management (TPM) lifecycle will drive the desired business optimization. The key is to integrate pricing and promotional models within the TPM system so account managers can easily calculate a lift factor leveraging base volume to forecast incremental volume — whenever needed and not only as part of an annual planning process. AFS Technologies has developed an integrated solution with Nielsen to calculate lift factors within AFS Trade Promotion Management Retail (TPM Retail). With a subscription to Nielsen’s store-level models, a manufacturer can click a button in AFS TPM Retail to determine optimal pricing strategies: beat competitors with price packs, defi ne thresholds, optimize base price, or mine the gaps. To date optimizing through predictive analytics has been somewhat complex. But by integrating a library of models within a TPM system, it creates an easy-to-use and cost effective approach. Ease of use allows manufacturers to prove the concept by modeling single accounts and products.